Thanks to an unofficial Compiz plugin, you can now move the Unity (only works with Unity 3D!) launcher to the bottom of the screen. Sooner or later, this just had to happen since this was probably the most requested Unity feature. 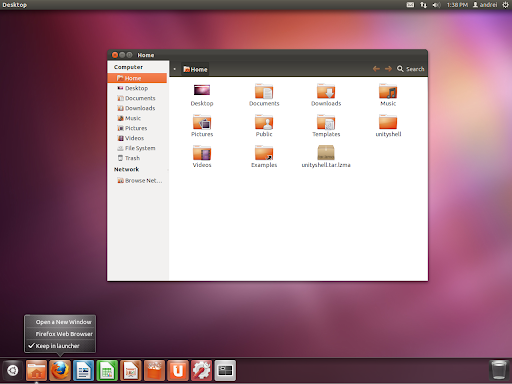 The custom bottom Unity launcher can be configured just like the default launcher and supports all the built-in customizations such as autohide, blacklight modes, etc., though there are no new options. You can't move it back to the left using regular settings though, but this can easily be done by simply removing the plugin (don't worry, you just have to remove a file if you want to go back to the regular Unity launcher). Dash looks broken if it's not maximized while using the bottom Unity launcher. Click for a screenshot. This can be avoided by using Dash in a maximized state (simply click the maximize button for Dash in the top left corner) as you can see in the screenshots above. if you want to use smaller Launcher icons, there is a gap between the launcher and the bottom of the screen. Luckily this bug is not permanent and can be solved by restarting Unity after changing the icon size (or log out and log back in). You can't drag icons from Dash to the launcher. However, you can still pin applications that are running to Dash. These were the only bugs I've encountered (tested using both Unity in the main Ubuntu repositories as well as the latest Unity available in the proposed Ubuntu 11.10 Oneiric Ocelot repositories) but obviously, I cannot guarantee there aren't other bugs that I didn't discover (especially since I've only been using it for a few minutes). 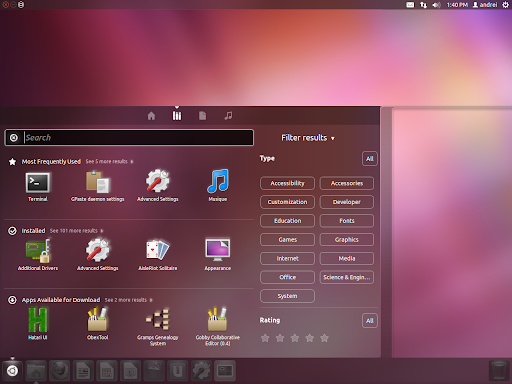 Update: Paullo, who created this "tweak" said in a comment @ ubuntu.onego.ru that when Dash will be fully supported (when the issues I've mentioned above will be fixed) by his "bottom launcher", he will provide the source and also create a Launchpad PPA for easy installation (so it should then be available for both 32bit and 64bit). Until then, this is only available for 32bit. There are also plans to include settings for changing the quicklists alignment and even an option to disable hiding the window buttons and menus for maximized windows. For now this only works on 32bit! 1. Firstly, download the plugin from HERE. Alternate download link. 3. Extract the downloaded archive to your home directory. A new folder called "unityshell" should be created upon the extraction. If you use the launcher with autohide, make sure you set the reveal mode to bottom in CompizConfig Settings Manager.